EDINBURG — After six months of learning and practicing five- to 10-letter words, Veena Namboodiri fell short of making the final cut for the Scripps National Spelling Bee on May 30 in Washington, D.C. The 13-year-old was one of 515 contestants competing for the national title. She qualified in March after winning the Rio Grande Valley Regional Spelling Bee at Texas State Technical College in Harlingen. She along with her parents and twin sister flew to D.C. May 27 for the event. Bert Ogden Auto Group CEO Bob Vacker poses for photo with local speller Veena Namboodiri and her father Hari Namboodiri on Thursday at Fiesta Nissan in Edinburg. 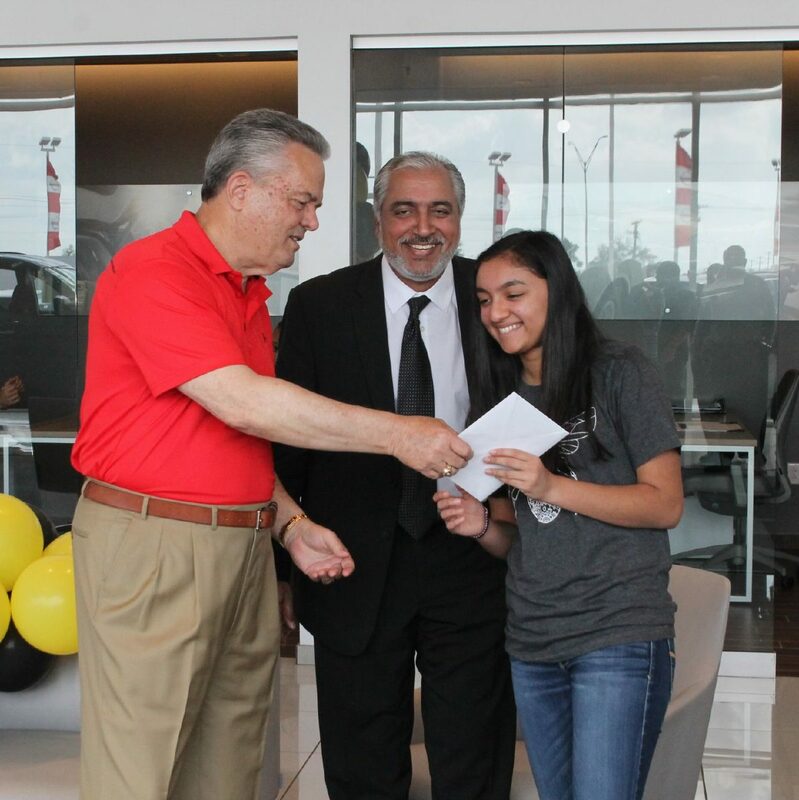 Local speller, Veena Namboodiri smiles after receiving a congratulatory card with some cash from Bert Ogden Auto Group CEO Bob Vacker on Thursday at Fiesta Nissan in Edinburg. Namboodiri said she felt more comfortable reaching the stage portion of the spelling bee. She added that even though she didn’t make it to the finals, she was happy with how she had made it. The event began on Monday with a Memorial Day barbecue, where the contestants had a chance to meet one another before the spelling bee preliminaries Tuesday and Wednesday. The preliminary rounds consisted of vocabulary questions, but as Namboodiri wasn’t familiar with the format and didn’t know the point system calculations, she didn’t place high enough for the finals. Her second round word was abseil and her third round word was empirical. The Edinburg student said loved the experience of being able to compete with the support of the Rio Grande Valley. 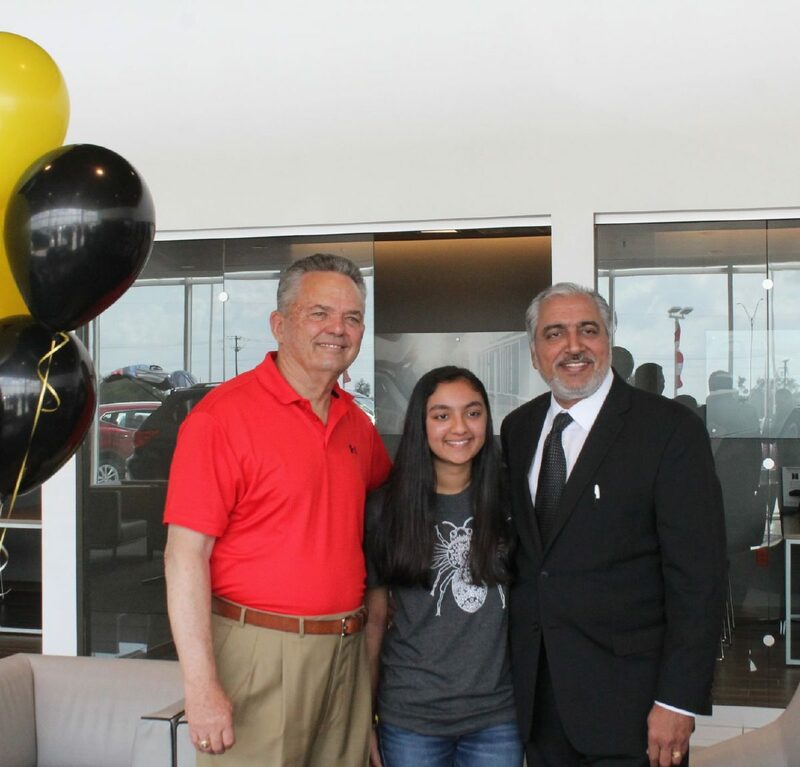 Thursday, the Bert Ogden Auto Group branch of Fiesta Nissan dealership in Edinburg held a special ceremony for Namboodiri and her family in honor of her making it to Washington. The small ceremony included local employees of the dealership and a surprise visit by CEO Bob Vacker, who gave her a congratulatory card with some spending money inside.